Sir Thrift A lot: Pyrex Collectors: What's Your Rarest Piece? 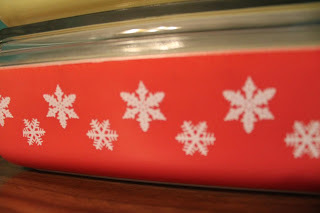 Pyrex Collectors: What's Your Rarest Piece? It's bragging time - what's your rarest piece? Since I have acquired this piece, I haven't seen it for sale. Just recently it was up for sale on eBay in the United Kingdom. The piece is the coral red snowflake space saver. Surprisingly I picked mine up off the shelf at Goodwill a few years ago when shelf Pyrex was more plentiful in the area. I assure you it was only on the shelf because it was priced at $16.01. It's also pretty safe to say that if the seller was able to ship to USA/Canada the piece would have sold for higher. I need to stop telling my boyfriend how much things are worth. He bothers me to sell, sell, sell! It's a JAJ piece & did you know that I am now just finding out that JAJ means "James A. Jobling" & this piece is from the Gaiety line. Gaiety has to be my favourite line/pattern of Pyrex. So, with that revelation, fellow collectors, I'd love to know - what is your rarest piece? My husband does the same thing....."are you going to sell it?". Do I sell anything?! My rarest piece would probably have to be my Starburst Space Saver. It was a birthday gift to myself a couple of years ago. Sadly I haven't come across any "rare" pieces. Most of the stuff I come across is pretty common. I had the Bluebird promotional at one point, but sold it. I find a lot of promos. That is a thing of beauty for sure! I don't have any super rare pieces, just a few harder to find ones. My Black Rooster or Saxony probably are the hardest to find that I have. I don't have any rare pieces either - I think I would be tempted to sell that snowflake piece but I know you never will!! I don't collect Pyrex, I collect Fire King. My mom collects Pyrex, and I was able to piece together a set of Bluebelle mixing bowls. I'm giving her the set for Mother's Day. Damn! good job! Dontcha love it win you score a winner like that? I think that is just too cool. It's a really pretty piece, plus the fact you found it in the wild is awesome! I don't think I have any Pyrex that would really be considered rare. My rare-ish/desirable pieces would probably be my UFO, and turquoise hostess chip/dip with bracket. Green Christmas bowl and the starburst space saver. That snowflake is awesome. When my spouse asks if I'm going to sell, I say it's my raining day day fund. Lol. Truth is it would have to flood/storm pretty bad to let go of some of my pieces. Oh, I just thought of another rare set. My Blue Americana. Totally thrifted. And my Eyes chip & dip. I think most of mine is pretty common, so I'd say one of my promotional pieces, either 2 1/2 qt. Cinderella casserole with gold hearts a 1958 promo, or the 2 1/2 qt. gold grapes & leaves casserole a 1959 promo. I cook in both of them, they are great when you need a large baker. I use all of mine and have for years. My Barbed Wire divided dish is probably my rarest, although I know it's not all that rare. And I just found and bought for my mom a Black Rooster space saver. I understand that it's pretty rare? Love your coral red snowflake piece! I don't collect it but i do buy it to sell it. I should really start paying attention to pricing, I sell them all the same. Ha! I have a few rare-ish pieces (pink Butterprint 473 and 472, both Eyes bowls, both Balloons, the smaller two of the Earth Tones 400-series set, the Pineapple Party 404, a large pink Daisy space saver and lid, some promotional 045s whose names I can never remember; and a bunch of Jadeite and Federal that is now hard to find) but my favourite -- and daily use -- dishes are Autumn Harvest and Verde, which are common and cheap. Your red snowflake is so beautiful. A keeper for sure! My rarest piece is probably my starburst spacesaver that I found in an antique mall for $7.00. I also really like my pink butterprint bowl, barcode bowl, and my complete set of new dot mixing bowls.